Minimalist home design doesn't have to be cold and all white! We give you tips on how to use it. Minimalism is a growing lifestyle trend that focuses on living life more fully by having less. The idea of living simply has started to apply to home design as well. A lot of homeowners want the calmness that comes with an uncluttered house and open spaces, but are intimidated by minimalist home design. Because of the simplicity of the design, it’s often perceived as stark white rooms that have little to no furniture in them. Minimalism isn’t as intimidating as you think. Incorporating these four characteristics of minimalist home design can help you to have a simpler home while avoiding an empty house. Minimalist interior design is defined by wide open spaces and simple style. By using minimalist characteristics in your wall and flooring design choices, you are creating a frame that can stand up to the simplistic design that will be pulled in with your furniture and accents. The key is to keep the room open, but not bare. Use plain walls to your advantage by adding interesting design elements to the walls themselves. If you want to keep the wall treatments simple, you can paint them a neutral color. You don’t have to limit yourself to white walls! Consider off whites for a softer color. One way to add a dynamic visual element to your room while maintaining the minimalist style is by adding a texture to your walls. There are several different tiles that you can add to your walls for different effects. The first is oversized solid tiles that can be added to any interior wall. The matte finish is similar to a smooth concrete tile and adds a touch of industrialism to your home. It’s not a material you normally see on interior walls which creates an interesting focal point for your home. If you want to add texture to your interior walls, wood or faux stone tiles can be added to the surface of your wall. The neutral colors fit into your minimalist interior design, while the textures add a dynamic element to the room. You want your flooring to support the minimalist frame that you started to create with you wall treatments. Minimalist home design features flooring that is simple in design and color. There are so many different types of flooring design within each category that you can have almost any type of floor you want in your minimalist home. If you want wood floors, bamboo is perfect for light and airy rooms. It’s a durable material that is resistant to the moisture and warping that you typically find in other hardwood floors. White washed wood floors is another option for those that want the organic material of wood, but want a lighter finish. It may seem like an unconventional interior design option, but polished concrete flooring makes an incredible statement without being overdone. One of the major benefits of polished concrete is the lack of maintenance that it needs. It’s easy to clean and is polished to reflect light and make the space look bigger. Simple all black or white tiles are typically used in kitchens and bathrooms. The basic colors keep the design simple and away from ornate designs. You can use a neutral color carpet, but it can take away from the sleek lines that you create with the rest of the interior design. There are other design accents you can include to create the perfect minimalist space for your furniture. A defining feature of minimalist home design is an open floor plan that is filled with light. This helps the space to feel bigger, and therefore more open. Every design aspect should lend itself to the open and uncluttered feeling of your home. Large windows and glass sliding doors are two ways to allow the maximum amount of natural light into your home. Many minimalist homes choose not to use any window treatments on their windows. If you want the added privacy of a window covering, you can use a simple roller shade. This keeps the design minimal and doesn’t intrude on the surrounding home design. Another way to keep the flow of light and energy fluid in your home is to use an alternative staircase design. The traditional staircase design can be clunky and overbearing in a light and open space. Spiral staircases have the advantage of a small footprint. They can easily be tucked into the corner of your home and away from the center of your floorplan. If you want to place your spiral stair closer to the action of your floorplan, you can choose minimalist design options. By keeping the spindles to a minimum and using simple colors and materials, such as an all-black steel stair, there is plenty of open space left. If you want a straight staircase, but not the large frame, a floating stair is your solution. This modern stair option gives you the full steps of a straight staircase, but a completely open space underneath. This allows the pass through of light and opens up space that you would otherwise lose. When most people think of minimalist home design, they probably picture a strict color pallet of black and white. This can be intimidating and can make a room feel uninviting. Think of minimalist color pallets as complimentary neutrals, not stark contrasts. Just like the wall section, use just off whites as your lighter colors. There’s nothing wrong with using white, but off whites create a warmer environment. If black is too definitive for your liking, use a more muted charcoal instead. The tone is softer and won’t be as harsh of a contrast. 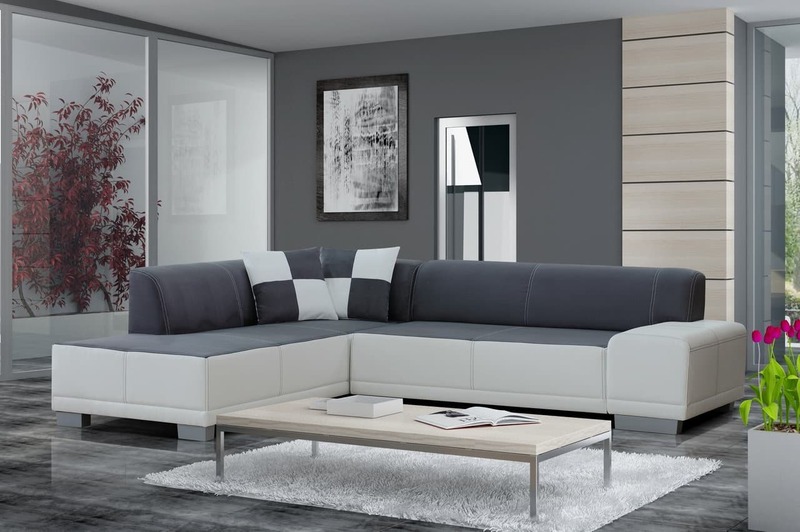 Lighter greys are another great core color for your minimalist home design. Similar to modern home design, you can use pops of color to accent the space. Keep it to a singular color and minimal accent pieces. You can either use solid bright colors or more muted patterns to create a contrast in your space. For singular bright colors, smaller pieces, such as pillows and table lamps. You can incorporate patterns in small pieces of textile throughout the room. The patterns should be tone on tone and be a subtle small pattern. For a pop of color on the walls, use a singular piece of art as a focal point. The piece can have either a portrait or landscape orientation, but it should match the lines that you’ve created with furniture and wall treatments in your room. The right furniture is the perfect last step to completing your minimalist home design. After you’ve created the perfect surrounding space, it’s time to fill your space with furniture that finalizes your desired style. You want to use furniture that is simple in all aspects. The forms of each piece of furniture should be simple with clean lines. You don’t have to limit your seating options to stiff benches and plastic chairs to achieve this look. You can have upholstered furniture that’s comfortable and perfect for your living room. The key is to keep it tailored and close to the cushion. Overstuffed furniture is great for rustic homes that have a country charm, but they can look bulky and out of place when surrounded by minimalist interior design. The same can be said for tables in your space. You can use pine tables for a light wood that adds warmth without looking too heavy in your space. You can keep the theme of openness by choosing open frame furniture. This can usually be found in the form of clear tables and basic metal frames. A glass coffee table allows light to pass through it completely. If you want a clear table option that is more budget friendly, there are several different acrylic table designs. These provide the same look, but at a much lower price. Side tables with open frames are usually made from a metal base that is then brought to a flat platform as the table top. The open frame keeps the table from looking too bulky in the room. You can also find open frame couches and chairs. These pieces have metal legs that create a then rectangular frame at the bottom of the couch or chair. Décor accent pieces can help your minimalist space to feel more like a lived in home. Minimalist home décor is often seen as empty and bare. Accents can add softness to the crisp lines that otherwise fill your space. Keep these accents small and simple. You never want to add anything that with overtake the space. The purpose of minimalist home décor is to keep all of the pieces working in tandem and as simple as possible. One simple way to add softness is to use light fixtures that have rounded edges. It adds a nice contrast to your otherwise angular room. You can also use your light fixtures to be sculptural pieces in your home. If you want to take advantage of more of the natural light coming into the space, you can use large mirrors to reflect light around the space and make it feel even bigger. You can use an ornately carved frame for your mirror if it is a neutral color. You can also find large mirrors that are in simple traditional frames. These giant mirrors can be leaned against a wall as a focal point in the room. Never be afraid of white space in your home décor when you’re looking to achieve a minimalist aesthetic. Finding storage space in your minimalist home may seem counterproductive. The whole purpose of adopting this home design is to simplify your life, and narrow down your belongings. However, minimalism is subjective. It may not mean having the bare minimum amount of belongings, but rather simplifying your life to the point when you feel comfortable. This being said, you may need to find ways to store your belongings that won’t fit into your minimalist home design. Keep the clutter down by using hidden storage ideas. One of the most popular designs is to create small spaces in your floor and install a trap door. You can then store extra items in the floor in a seamless and unassuming way. 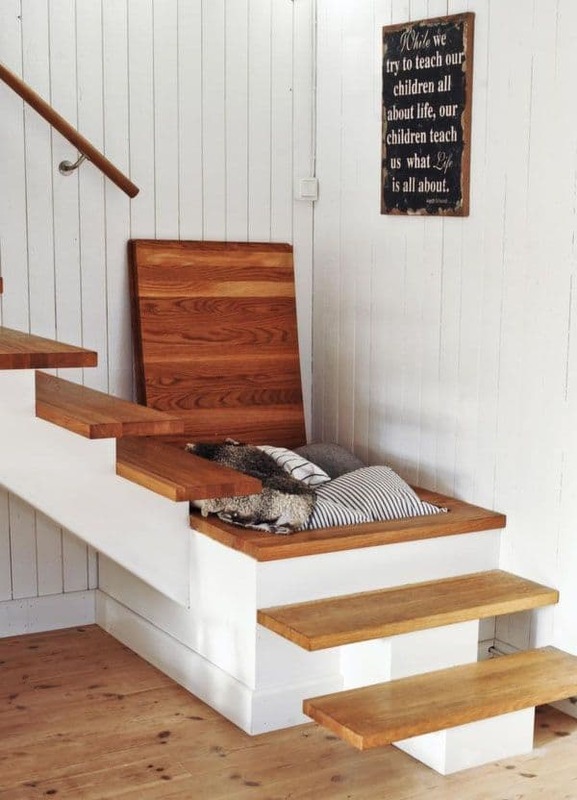 Trap door storage doesn’t impede on your minimalist home design at all. If you don’t want to use hidden storage, or don’t have the infrastructure in your home to create it, you can use open shelving. Putting things out in the open may not seem like it fits into the minimalist design style, but open shelving embraces the idea of open space that allows the pass through of light. They are the perfect alternative to closed off cabinets. To better fit into your minimalist home décor, simplify the items on the shelf. If you plan to store books on the shelf, cover the different color covers with a uniform neutral fabric. Minimalist design aesthetics can help you make the most of your space without overwhelming it with complicated designs. The right colors can help to take your home's design to the next level. However, if you want to make a more extreme minimalist change, the opportunities are definitely there. 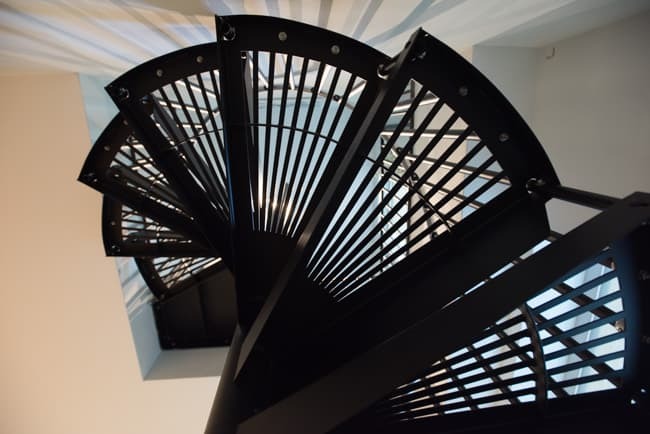 If a spiral stair is the right minimalist design choice for your home, give one of our consultative designers a call for pricing in five minutes or less.